The clove is a tropical evergreen tree of the myrtle (Myrtaceae) family. The tree can grow to be 90 years old and may yield 800lbs to 1,000lbs of cloves per year. The familiar clove buds are the dried, aromatic flowers of the tree. They are picked before the blossoms open and dried for 48 hours in the sun, becoming brown in the process. These are then ground down into a fine powder and added to our products. The name clove comes from the Latin word ‘clavus,’ meaning nail, as the buds were thought to look like them. 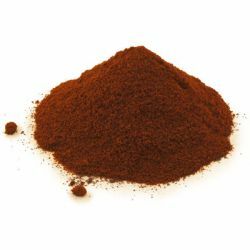 We use clove powder in the warming, spicy Li’l Lush Pud, our Christmas Ballistic. It looks and smells just like a traditional Christmas pudding!